Door posts faded? 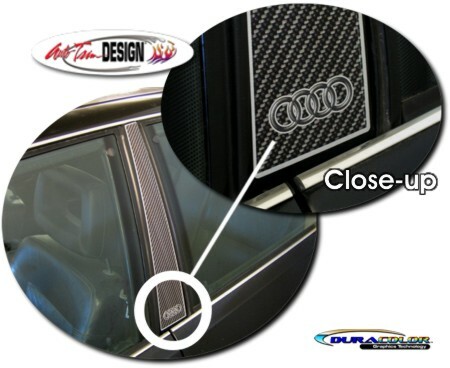 Detail and protect them with these unique Simulated Carbon Fiber Pillar Post Graphics. Manufactured with our DuraCOLOR Graphics Technology, this three dimensional looking graphic set will enhance the overall look of your ride. Packaged as a set of two (2) - one for each side - the simulated carbon fiber print is surrounded with a fine Silver Metallic outline and features the Audi logo as shown in the image. Decals will fit any '88-'91 Audi 90. They may even fit '89-'94 Audi 100/200's (please measure and check the sizes prior to ordering). They are very easy to install and will look Great on any color vehicle! Includes easy-to-follow general online instructions. Get yours today!